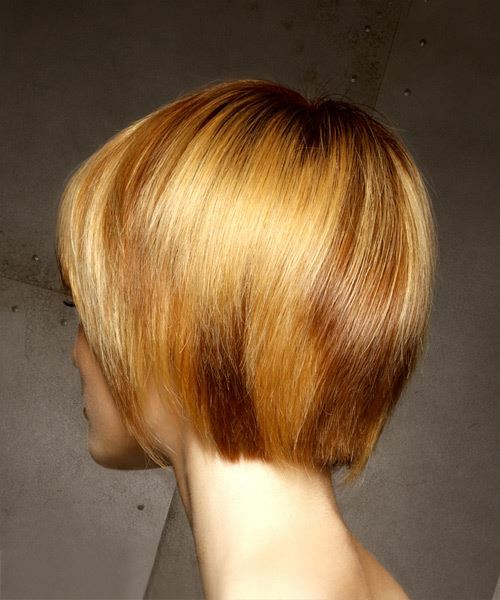 Our model's copper and blonde layered bob is blow-dried perfectly to smooth down the top while the ends curl under slightly for a fabulous finish. The layered bangs are worn down to frame the eyes and temples and complete the overall look brilliantly, while the length in the front shows off our model's strong cheekbones. Regular trims are needed to maintain this hairstyle's shape. Use root-boosting spray before blowdrying for extra volume on top.